The focus of the Senior Years is to prepare students for life beyond the College. Our day commences at 8:30am and concludes at 3:20pm. The Secondary School have two 30 minute lunch breaks. 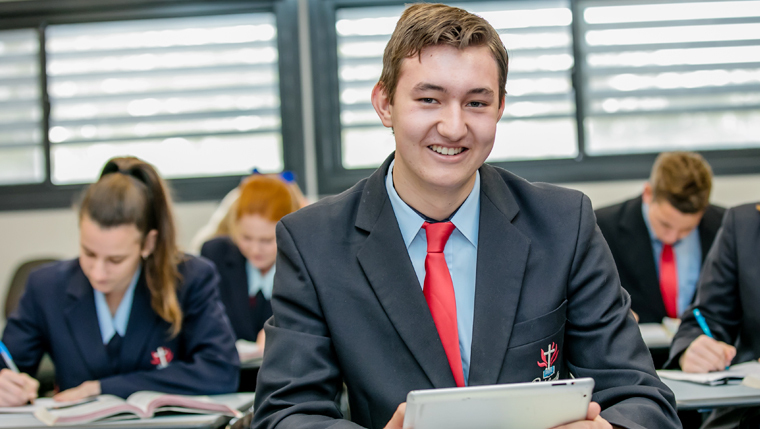 For more information about our Senior College, please contact Administration during office hours on 3380 4200 to arrange a time to view the College, meet our staff and ask any questions you may have. Prerequisites apply for students wishing to take Mathematics B, Physics, Chemistry & Mathematics C.
The VET Department operates under the guidance of Miss Jessica Grounds, Head of Secondary College and Mrs Rebecca Wallis, Senior School Coordinator. Mrs Deanne Hudson, VET Officer, keeps students informed of School-based Apprenticeship and Traineeship (SATs) opportunities, Work Experience programs, Tertiary Open Days, Scholarships and assistance with resumes. For more information, visit our VET webpage.